Recommended for truck, bus, and mobile air brake, and service lines where heat and battery acids are not present. Conforms to SAE J844 specifications. Meets D.O.T. FMVSS 106. 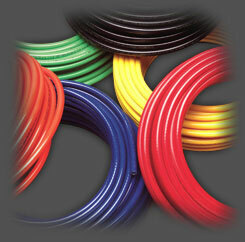 Tube: Heat and light stabilized seamless extruded nylon. Cover: Nylon. Available in black (NABTA), blue (NABTB), green (NABTG), red (NABTR), yellow (NABTY) and orange (NABTO) colors. Other colors available upon request.